Another referendum means another bout of media self examination. I suspect it will see journalists in the firing line from public and politicians as well. Can the news media get it right this time? The BBC will need to think yet again about how it avoids the charge of ‘London bias’ from nationalists after the 2014 poll. It will also have to take on board the criticisms that it got the idea of balance and truth-telling wrong in the EU campaign. Throw in the agenda-driven reporting of our partisan press and a large dose of online ‘fake news’ and propaganda online and we are in for a (another) fascinating political media period. Politically this campaign will be much more unstable and unpredictable than 2014. Firstly, will it even go ahead? If it does and it happens before Brexit is finalised, how do you frame a debate about a series of hypotheticals? In effect, the question will not just be ‘Should Scotland be independent?’ but ‘Should Scotland be independent and stay in the EU?’ The power to deliver on the answer to that latter question rests not with the Scottish politicians but with the other EU states. The polls are currently pretty even though the ‘No’ vote seems marginally ahead. Much more could change as the outline of a post-Brexit Britain becomes clearer. The Labour Party, its leadership, and even policies might alter over the next couple of years. And then there’s a general election pending for 2020 with the Tories defending, what is a relatively small parliamentary majority. It looks like the parties will campaign separately in Scotland this time adding to the political variables at work. I expect the ‘unionist’ newspapers to launch a version of ‘project fear’ again. But will the liberal/left press be more sympathetic to independence if it means a bit of Britain might stay in the EU? The EU referendum campaign started as an economic argument but ended up as a mixture of identity politics and a protest against the political establishment. Will the success of that kind of less ‘fact-based’ politics help or hinder the Scottish nationalist cause? Social media was a virile space for debate in 2014 and can only be more significant this time around. Expect some bitter and nasty stuff in social media but also look out for online interventions such as automated ‘bots’ seeking to spread messages. Online profiling of voters may have been exaggerated as a factor in the recent US and EU campaigns but the software is getting better and may well be deployed more intensively and extensively this time around. This will be another live mass experiment for the filter bubble question. Will social media and other digital tools allow a healthier, diverse, engaged and informed debate or will everyone be screaming into their own echo chambers? And, of course, the landscape of mainstream media in Scotland continues to shift. 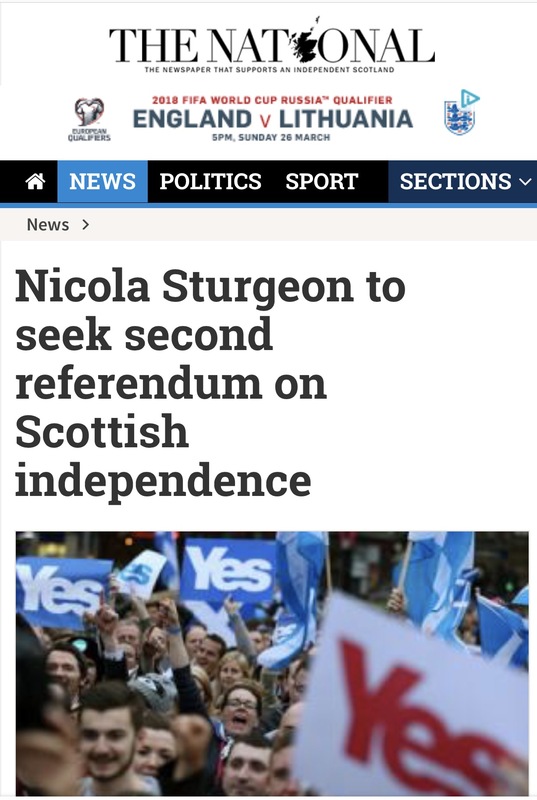 The BBC has a revamped Scottish news service and Scotland now has it’s own pro-separation newspaper title, The National, that campaigns fervently for independence. I am certainly not going to try to call this one. In a parallel universe where I had the honour of being born in Scotland I would have voted ‘No’ last time around. But in the wake of Brexit, I’m not so sure. I think Nicola Sturgeon is taking a massive risk – but in a way she had no choice. It looks like being a tight race and as we saw with the 2014 vote, the 2015 UK general election and the Brexit campaign, in a close campaign the news media, social media and political communications in general can play a crucial role.